This young girl of 27 years has completed her college from Dr. D.Y Patil Institute of Biotechnology and Bioinformatics in the year 2010. 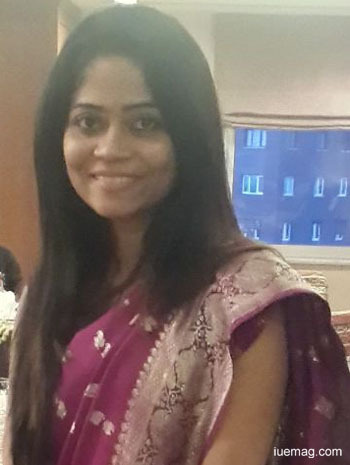 "Though I was always inclined towards social causes and wanted to do Bachelors, due to family pressures I did my 4 years degree in biotechnology," says Suprabha. Along with this degree she used to go and teach at Prem Dan located in Kharghar. Suprabha says, "I strongly believe that it's not important to master the art. Just knowing it and experiencing it can give you the BLISS feeling. I love trying different things in life from guitar to trekking, from experiencing writing, learning the art of charcoal painting to hand on photography; I learnt them all!" On asking her about her secrets to a healthy enriched life, she answers, "I am into meditations called as prarnic healing. It's regular for a definite time interval, and this enriches my soul to the core." She believes in helping people, and this gives her the pleasure of growing into a dynamic and independent lady. She feels fortunate that the Supreme Being entitled her the opportunity to serve. "Yes, I am a learner, who had not so good childhood but as I grew up I got aggressive, I was a rebel, I mastered the art of getting things done according to me in my family. But what I was lacking was love and may be because my mom passed away when I was three and my dad was busy in his own world," said Suprabha with a sense of love for her mother and tears of hardships in her eyes. She has witnessed the value of LOVE and this is the reason behind her being so affectionate and lovable to those kids whom she is working for and may be getting it back! "After Biotech I hardly did job for 3 months and left it as it was not my cup of tea. At that time, I could have regretted what I studied but that was not me!" says this enthusiastic young lady. She started to work for causes first through Lioness clubs and then through Lions club. She worked on village development project in Wada called as Malwada. She feels grateful for the opportunity she got to serve many children with basics of aiding and education. "I always use to see kids on road, dirty, without proper clothes and used to wonder what may my life serve them," says this enthusiastic lady of 27. "I thank god for making me fortunate enough to avail access to my desires and at the same time I pray for their upliftment. But how? Does praying help now, its action that imparts. I took up initiative to find out the kids on road, those of construction site workers. They do not go to school as they migrate from one place to another. So, only option was to start school according to their stay. And Yes we did," said Suprabha. A sight of sheer happiness enlightened in her eyes. Construction site was of Regancy Group and in two visits they gave her place and access to teach kids. She is thankful To Mr. Thakker of that co-operation who helped changing lives of many. On 24th of April, 2012, she transformed her thoughts into purpose, and started teaching construction site workers kids in sector 35, Kharghar. "There were 45 kids initially which raised to 60 in June. I made a team with my friends to fulfill this purpose of mine in the best way possible and we taught them Hygiene, Moral values, Basic English Maths etc. It was immensely wonderful feeling one can ever imagine," mentions Suparbha. After that, they became more responsible to their teachings and started a search for new construction sites in that developing city. They covered 9 sites across Navi Mumbai with 560 children getting education and none of the site owner had any problem with Suprabha's this good deed. Right now, they have two sites- one in C.B.D sec 15 and other one in sector 21 Kharghar. Suprabha and her team also took them out for trips and educational programs. "35 children are now going to main stream schools," she says proudly. The project was named "suyash" - "teach each kid". Lions club of Navi Mumbai visionary, Lions and Lioness district 323-A2 are supporting it. As time passed, she realised that her thought had now shaped into a big dream project and soon it was time when 200 volunteers joined. "Suyash" is getting registered as an NGO by end of June 2014. She was invited to Turkey for presenting her work in LIONS Reading action forum in April 2014. The officials there were inspired by Suyash's visionary work and invited their proposal to be translated into Turkish and French, to inspire women and kids to get educated as the problems are same in Asia and in Middle East about illiteracy . Colleges like Dr. D.Y Patil B.Ed college and Changu Kana Thakur college, Panvel took it as social activity programme to send their students to teach these kids. 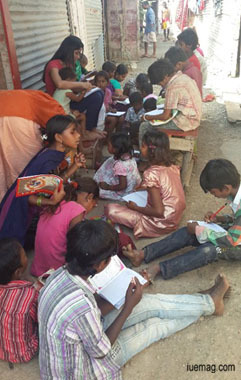 "Patel Smarak" trust provided the stationery and mid-day meals. "People said that it was waste of time. My close ones said that I did this as I didn't have other work to do. I thought that I will stop doing this but I believed in myself," recalls Suprabha. "When you want to work from heart, things fall into place" are the inspiring words by this young girl, who aims to work higher as a social activist. She was supported by Vaibhav Naik, Rajesh Prajapati, N R Parmeshwaran ,Paresh Thakur, Kushag Patel, who were the back bone of the project. Vikas Kumar, Neil Akash Das , Swati khade, Viswajit Dilip initially volunteered taking time off of their busy schedule. Paresh Thakur gave a proper outlook to the Suyash programme and became a strength of it. Suyash Is running because of the people who have faith on it! "The day all children will go to main stream school and the Suyash "Teach each Kid " project is no longer a necessity I will call it a success," says Suprabha. Just have faith in your dreams and no one can stop you from achieving it. "When you want to work from heart, things fall into place," she concludes. Any facts, figures or references stated here are made by the author & don't reflect the endorsement of iU at all times unless otherwise drafted by official staff at iU. This article was first published here on 24 July 2014.